Hi, guys! Hope everyone is enjoying their weekend! I have been so focused on Thanksgiving, and decorating for the holiday, that the date on the calendar saying it was the last day of November came as a bit of a surprise to me. So today, I am sharing my November tag for the Tim Holtz 12 Tags of 2013. This month he focused on using the Chalkboard Technique using the Ranger Embossing Antiquities Frosted Crystal powder and real chalk. This was so much fun that not only did I make a tag, but I also made a card using a Giant Tag by Ranger (#12 size). Tim made Fall themed tags this month, but I decided that since Christmas is very close that I would make holiday ones. 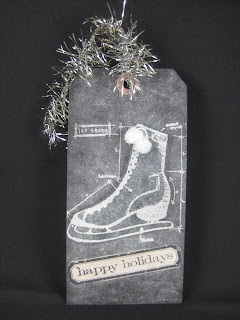 For the tag, I used Tim's iceskate stamp from his blueprint series. The skate was stamped a few times and foam squares were added to give it a 3D look. I also decided to add pom-poms to the skates as that brought back fun memories from my youth. The tinsel was then colored with Mushroom Alcohol Ink to give it an aged look. The Christmas Card was made with the Giant #12 Black Tag by Ranger as I mentioned above. It was scored and I used a punch to create the tie on the side. Seam Binding was used to close the card. 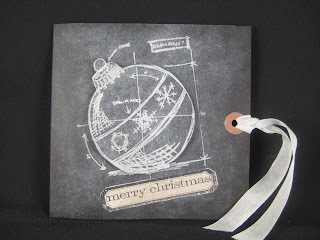 If you want to make a tag or a card using this technique, I would suggest you head over to Tim Holtz's blog as he takes you step by step in the process. Once you try Frosted Crystal powder, you will fall in love with it. Wishing you all a fabulous rest of the weekend! Until next time! Love your version of Tim's tag! I just did mine today too! Nothing like waiting until the last minute, ha ha ha. Thanks for sharing! Hi Winnie! Thank you so much for your comments to my blog -- I just wanted to let you know how much I appreciate you! also I wanted to tell you how wonderful your cards are! I love that chalkboard technique! Great cards! Brilliant! I really like the way the chalk technique worked with the Christmas tags, because it gives them the frosty look of the season. Have a blessed Advent season, my friend! Lovely (artsy) tags! You're so creative! Great tag, I love the little pom-pom on the skate .. what a cute touch! Beautiful. The skate is my favourite. Love the images you used with this technique! Great cards!